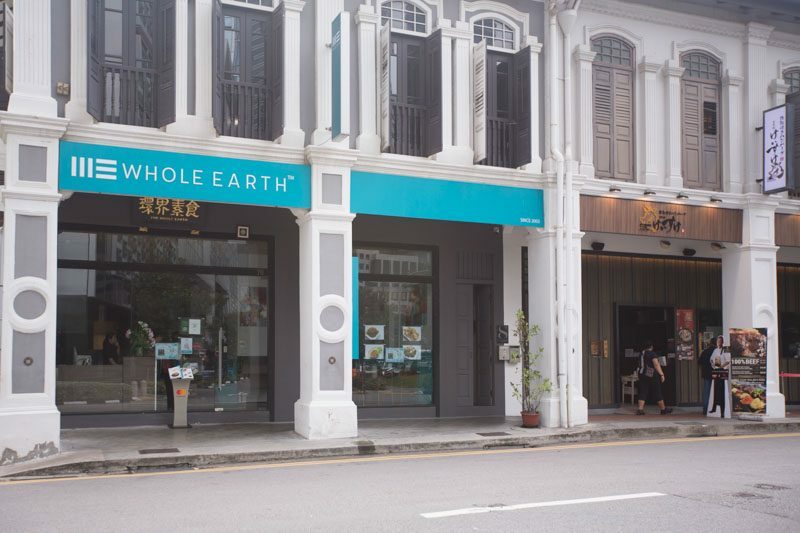 I was here two years ago when a vegan friend introduced me to Whole Earth at Peak Seah Street. Being a meat lover, I have always been sceptical about vegetarian or vegan food as I love my steak medium rare and I can’t give up on chicken nuggets. But as they say, don’t knock it till you’ve tried it. 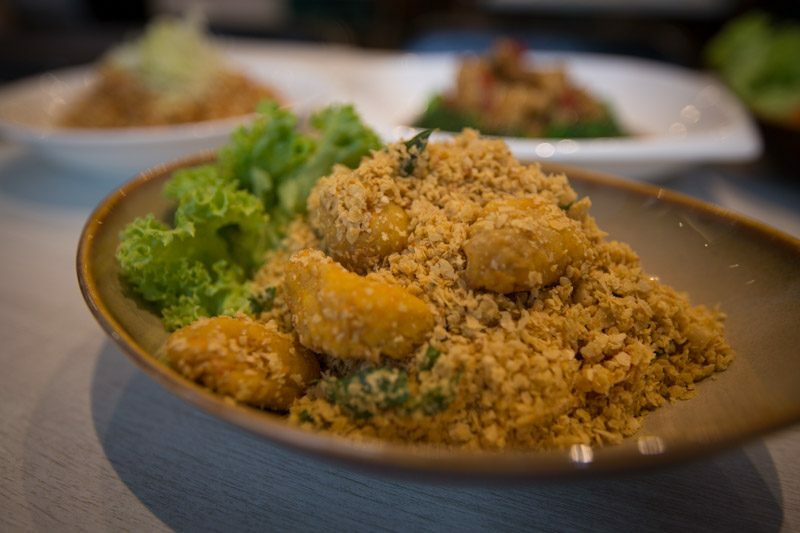 The vegetarian dishes at Whole Earth hits right at home, they are non-pretentious and cooked with love. 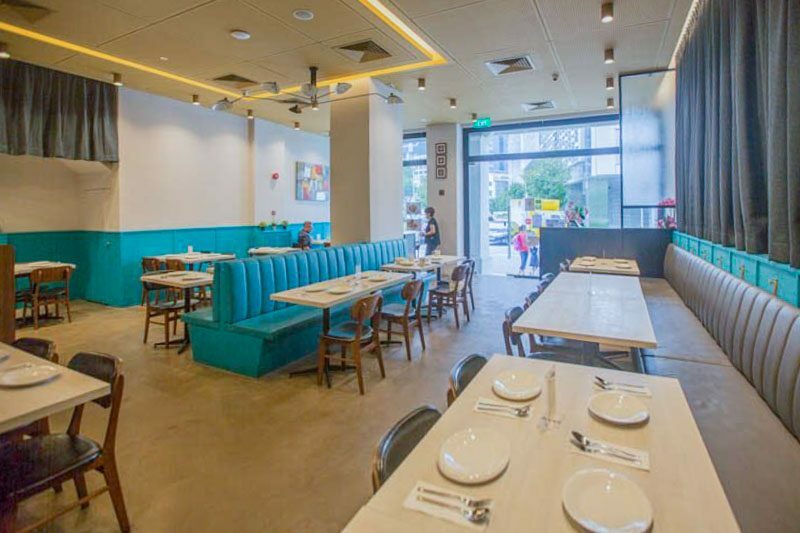 The restaurant is spacious with tables that can be shifted to accommodate large groups. The floor to ceiling glass entrance allows natural light to flood in, making the atmosphere bright and cheery. The first dish we tried is their best-seller, the Enchanted Forest ($23). 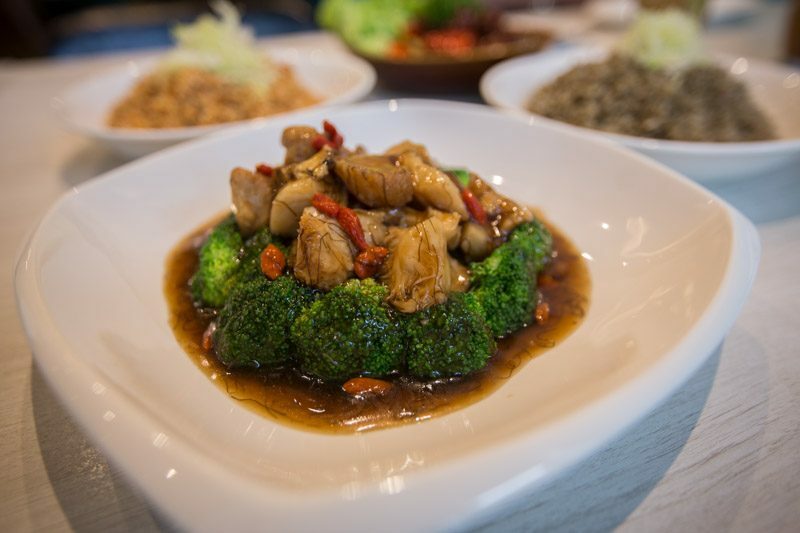 The dish consists of succulent monkey head mushrooms and broccoli, drenched in a specially blended sauce of angelica root (dang gui) and wolfberries. The broccoli wasn’t overly cooked and retained its crunchiness, while the texture of the monkey head mushroom (interestingly) mimics chicken meat. Who says vegetarian food must be dull and boring? 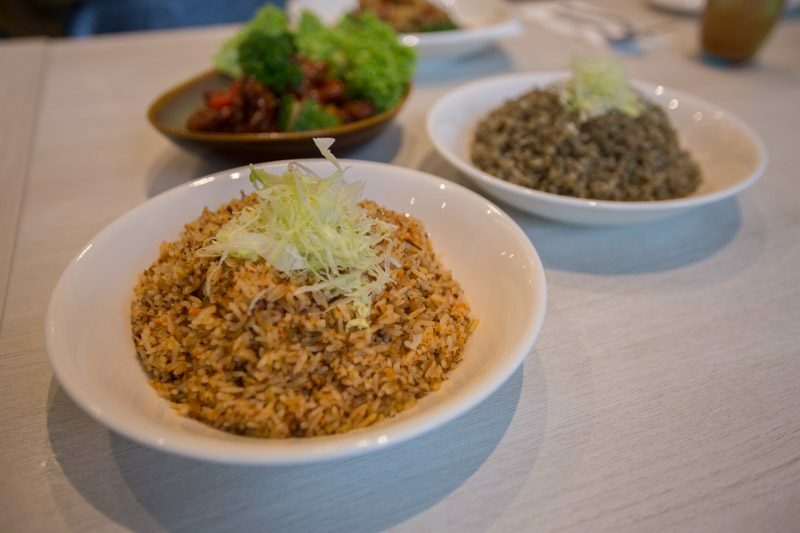 The Signature Olive Rice ($10) is a must-try. Nutty in flavour, not too greasy and a perfect one-dish meal. The grains are big and filling enough for two people. We were also recommended was the X.O Rice ($12). I was told that it took them 18 months to recreate the perfect recipe for this dish as they had to think of ways to find a substitute for the shrimp paste. The menu warned that it’s spicy, but as someone who loves spicy food, I found the heat to be quite mild. 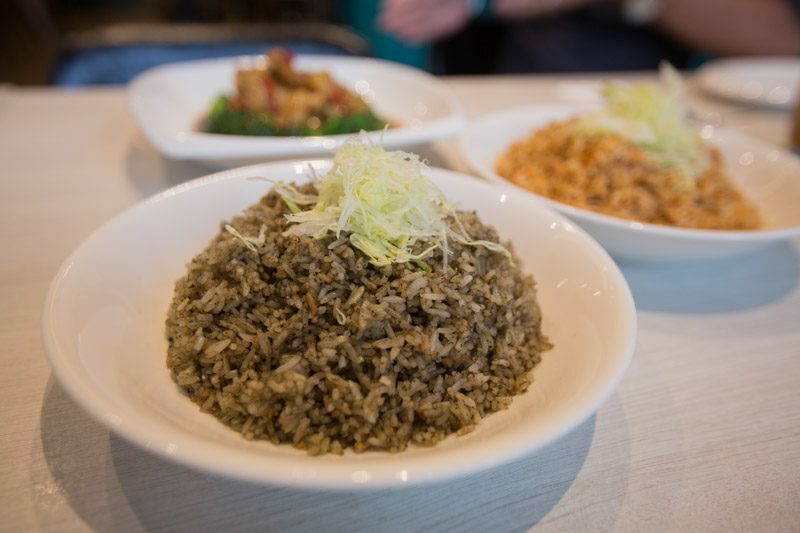 Between the two rice dishes, we preferred the subtle flavour of the Olive Rice as it does not overpower the accompanying dishes. The Sweet and Sour Delight ($18) was a dish well thought out, with all the flavours and textures achieving the right balance. The “meat” was made with soy, deep fried till crisp on the outside and chewy on the inside — my friend could have sworn he was eating pork and chomp on it happily. 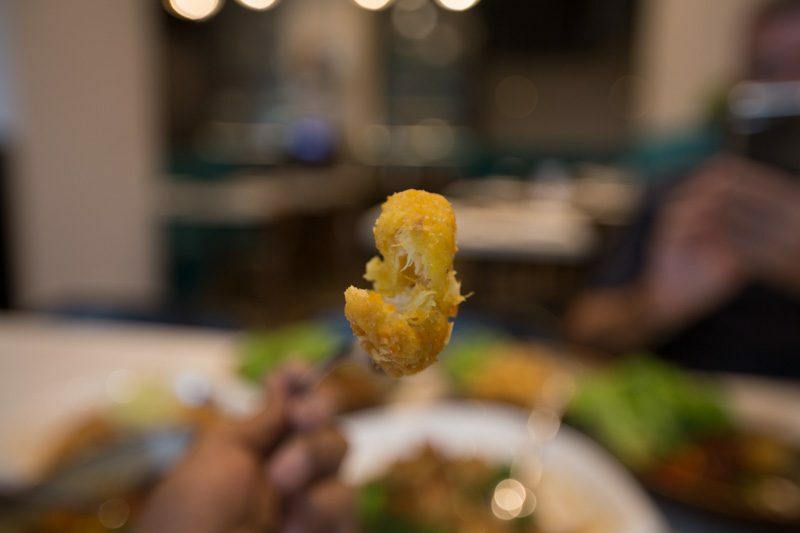 At first glance, the Cheeky Monkey ($25) looked like a plate of cereal prawns, from the crispy curry leaves to the deep fried monkey head mushrooms interspersed among a bed of oats. While the texture of the deep fried monkey head mushroom was far from that of prawns, it certainly did trick my brain into thinking I was having fish (just look at it flake!). This was one of my favourite dishes of the meal. And just like how I would eat my cereal prawns, I piled my bowl of rice with the aromatic oats. The Sambal King ($17) is simple, humble and deliciously good. 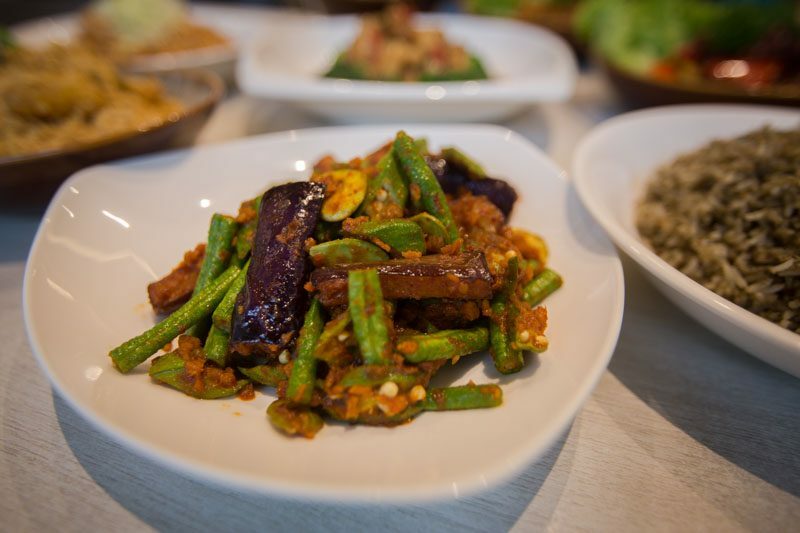 Consisting of long beans, aubergine, petai and lady’s finger, there were texture, heat and crunch; one bite is all it takes to unmask a burst of flavours. The problem with long beans is that it becomes too chewy when overcooked, but not for the ones in this dish. They retained a crunch that contrasted the other vegetables. 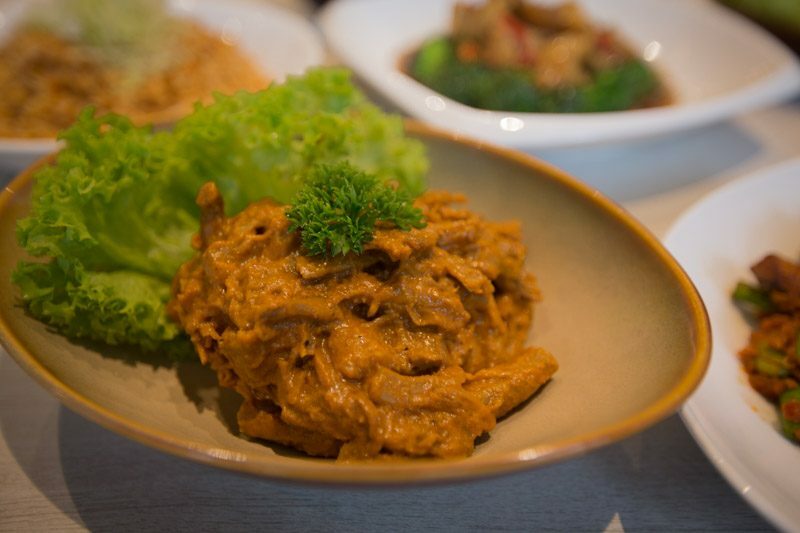 The Penang Rendang ($22) consists of shiitake mushroom cooked with a delicate mix of Peranakan herbs and spices. The shiitake mushroom has a strong woodsy flavour, its texture is slightly meat-like and chewier than other mushrooms, making it a great accompaniment to the full-bodied rendang gravy. 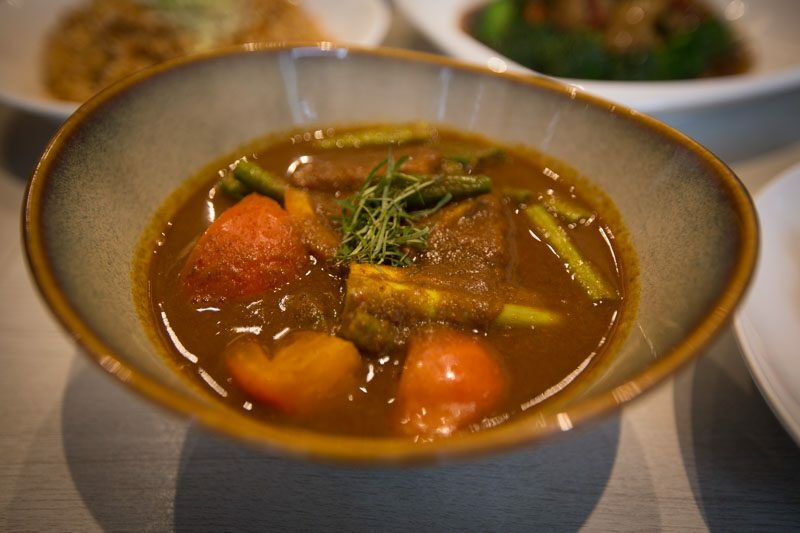 I highly recommend ordering the Asam Pedas Vegetable ($18) when you’re at Whole Earth, it will jolt your taste buds with its piquant and spicy flavours. The asam pedas comes with long beans and huge chunks of tomatoes. The sauce is of a thicker consistency and has a stronger tamarind taste than the ones I’ve tried elsewhere. I couldn’t stop slurping up the sauce and wished I had more space in my stomach to finish it with another plate of Olive Rice. No matter how full I am, I always have a separate stomach just for desserts. 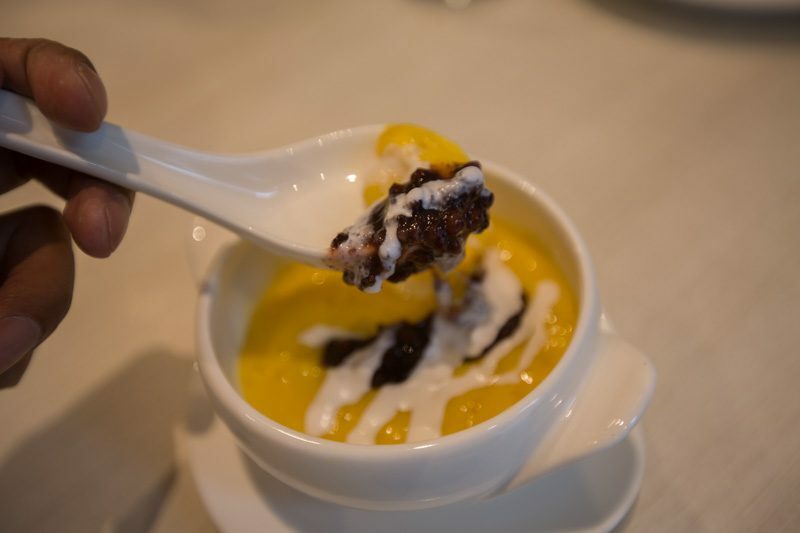 The Nonya Golden Pumpkin and Glutinous Rice with Coconut Milk ($6) is a great way to end the meal. The pumpkin is mashed into a puree-like texture. Initially, I thought the pumpkin would be too starchy and seemed like a really filling dessert. But it was sweet and easy on the palate, with the glutinous rice adding a nice chewy texture. 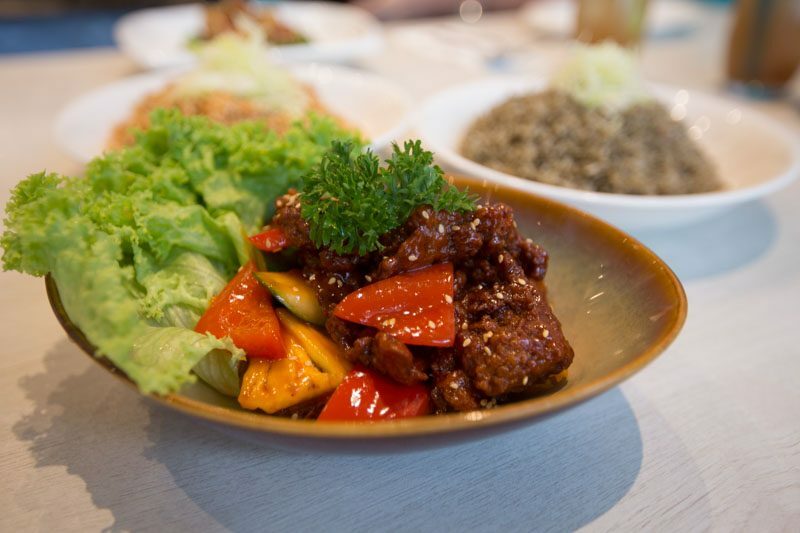 If you’ve been sceptical about vegetarian food, give Whole Earth a go with an open mind, and allow the complex flavours of the dishes to win you over. Michelin Bib Gourmand three years in a row? They’re definitely doing something right.